One of the most consistently frustrating experiences of being non-binary is that you are misgendered more or less constantly. Whether going out to eat or dealing with clueless family or coworkers, misgendering is constant and can make an otherwise great situation stressful, to say the least. But what if we could get people to not only use correct pronouns for the non-binary folks they know, but even default to gender-neutral pronouns when they don’t know an individual’s gender? 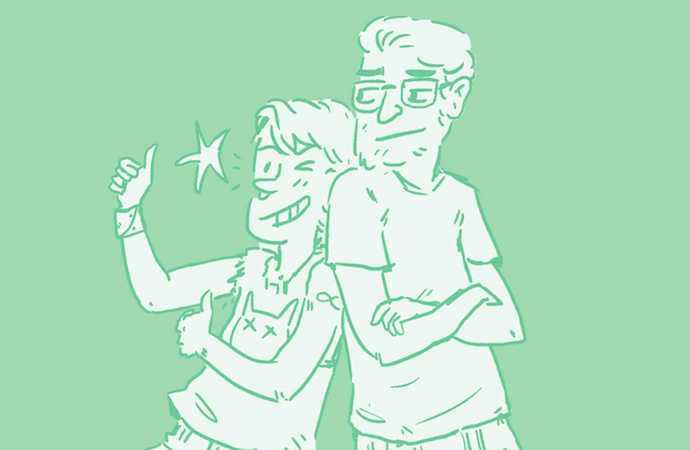 That’s the goal of A Quick & Easy Guide to They/Them Pronouns by non-binary cartoonist Archie Bongiovanni and their cis male pal Tristan Jimerson. The book is structured as a dialogue between Bongiovanni and Jimerson in which they explain they/them pronouns to the audience, with Jimerson alternately taking on the role of both clueless audience surrogate and cis ally trying to help others do better. 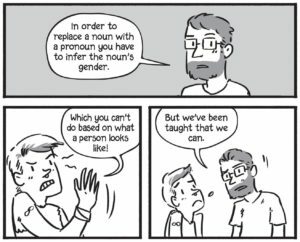 It’s a structure that should work wonderfully to get across how and why pronouns are so important to so many non-binary, genderqueer, and trans folks. 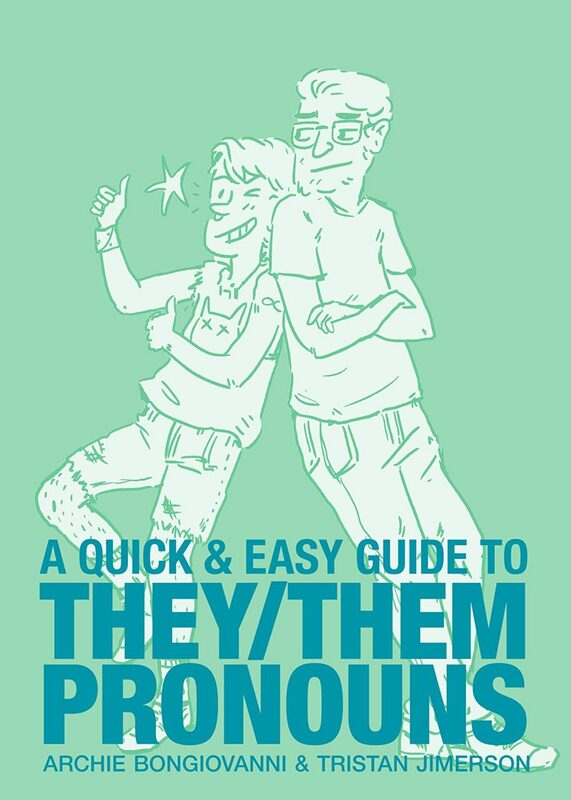 And yet, as an out non-binary-type-person and they/them-pronoun-user, I found the Guide largely underwhelming. While the book’s charming art and witty banter made it a fairly fun read—in addition to a quick and easy one—the narrow focus on pronouns meant it glossed over the issues where it could have offered readers genuine insight into they/them-pronoun-users themselves. 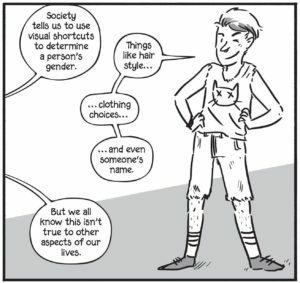 ARCHIE: Now one might be asking why would someone choose to use gender neutral pronouns? ARCHIE & TRISTAN: IT DOESN’T STINKIN’ MATTER! ARCHIE: You aren’t owed an explanation or reason for someone wanting to use different pronouns. While this statement is undoubtedly true. The decision to avoid any real discussion of non-binary and genderqueer genders outside of pronoun usage severely limits the value of the Guide as a tool for teaching clueless family members, friends, and coworkers. Unfortunately, that’s the book’s entire purpose. If I gave this book to my mom, for instance, she might understand a bit better that being constantly misgendered is exhausting, and she might pick up some tips for how to correct people when they misgender me. But, she wouldn’t really get any better understanding of why I use they/them pronouns or of what being non-binary means. I recognize that I might be asking too much for a 60-page comic with “quick and easy” right there in the title. 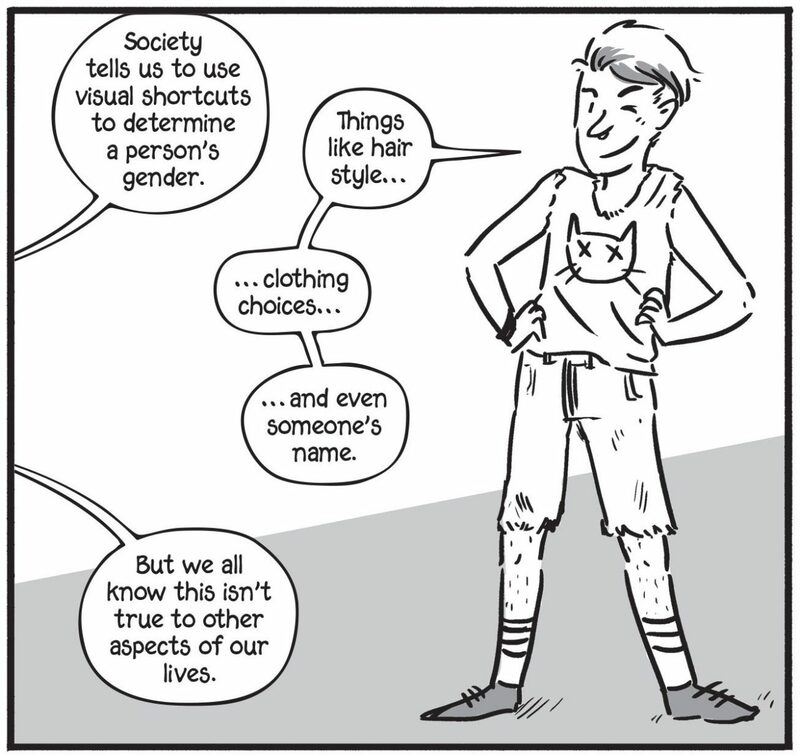 The focus is solely on explaining they/them pronouns, and by and large, the Guide does that well. But, without context getting to why people use they/them pronouns in the first place—as well as why grammatical arguments against the singular they are wrong—I’m not sure it’s going to convince anyone who wasn’t already convinced. 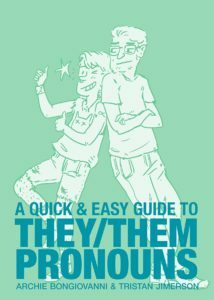 Ultimately, this makes A Quick & Easy Guide to They/Them Pronouns not so much a book for those who need it most, but for well-meaning (but clueless) allies who still have much to learn about treating non-binary folks and other they/them-pronoun-users with respect.